I first came across The Evangelical School Berlin Centre (ESBC) in Frederic Laloux’s book ‘Reinventing Organisations’. It opened in 2007 under the guidance of director Margret Rasfeld and today, with some 1,500 students, it has become internationally recognised for its innovative curriculum and organisational model. Last week I had the chance to visit ESBC on one of its Open Days. 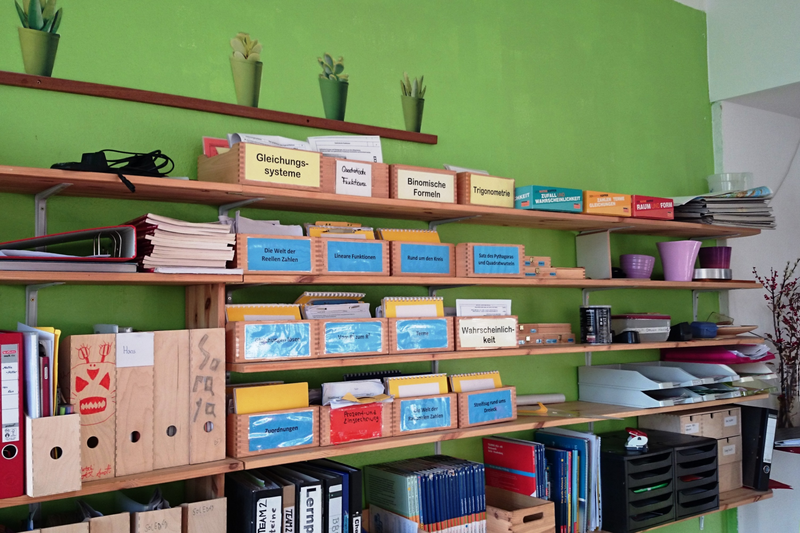 I sat down with one of the teachers, Christian Hausner, to learn more about self-management as both a cornerstone of how students learn and how staff work together. After navigating corridors swarming with parents and students volunteering as tour guides, I found Christian’s classroom where a few parents had gathered to learn about student projects at ESBC. Three of Christian’s students stood at the front and talked about the project process (more about that later). I was amazed by how adult they seemed for 12 to 14-year-olds. Not reluctant or coerced or shy, but happy to talk about their experience of the school. After show and tell was over, Christian and I sat in the corner chatting and when the occasional lost parent would wonder in, a student — without prompting — would come to their aid. Christian nodded proudly in their direction, “they’ve got it under control.” He began to describe two aspects of ESBC that make it unique: their innovative learning design and the how the staff members work as a team. ESBC is an ‘agenda school’ which means the curriculum is designed around the UN’s Global Goals for Sustainable Development. The aim of their curriculum is to support children in learning to gain knowledge, act, live together, and be. Every morning students have a 90-minute block comprised of four subjects: maths, German, English and social studies. These blocks are referred to as ‘Learning Spaces’, where students self-manage their learning by selecting a predesigned unit from a subject of their choice, for example ‘Equations’. Each class contains 26 students of mixed ages and two teachers. However the main twist is that teachers no longer act as experts or offer input, their role is more to manage the space and keep time. If a student gets stuck, they must ask two fellow students first to try and find the answer before asking a teacher. All teachers and students are trained in Nonviolent Communication and once a week there is a ‘Class Council’ in which people can discuss and deal with tensions in the group. Students take on different roles and moderate each other. The school also has a weekly gathering which includes a round of praise (where anyone can get up on stage and praise someone else), a round of ‘speak your mind’, and ‘people with a message’ (where they invite an external person of interest to speak — most recently it was Raúl Krauthausen, founder of Sozialhelden and creator of Wheelmap.org). On Thursdays students work on their projects — they are required to produce three each year — that focus on one of the global goals. They follow a project process similar to Design Thinking with the following steps: inspiration, observation, analysis, imagination, presentation, and implementation. In Christian’s class, they’re exploring discrimination and Berlin identity so students are currently interviewing people from all walks of life to empathise with them and gain insights in order to develop a sustainable solution for their community. At the end of the week, students go through their log books with their teachers. The log book is an essential component of the children’s learning experience. Each week, students set a goal for themselves and day by day, they fill in what they have been doing (and crucially what they have learnt) in their Learning Spaces, subjects, and projects. In the top right-hand corner of the page is a box where they complete the sentence ‘I am proud of…’. Their teachers sign the page and there is a column for parents to add their thoughts and feedback (positive and negative) as well. There are no grades until the ninth grade and yet the school performs extremely well in Germany, particularly in German and English. Similarly, in Finland (a country whose education system is regularly praised in the news and on social media) it’s not mandatory to give students grades until the eighth grade. More and more, we are seeing evidence that putting pressure on children and testing them relentlessly (in the UK, for example) is harming both their performance and their mental well-being. Teachers also have to collaborate to work out the units together and design the material. As well as Nonviolent Communication training, staff have also trained in Team of Teams, and most recently The Art of Hosting in order to host more effective, mindful meetings and conversations. Christian explained it can be difficult as a teacher not to “teach from the front” but the system (of children choosing their own units in Learning Spaces, for example) helps them avoid the temptation to become lecturers. He believes this change — from teacher as expert to teacher as facilitator (my word) — is the paradigm shift we need in the world. As I walked around the halls of the school, something felt different. There was schoolwork pinned up outside classrooms in a familiar fashion but here it seemed more authentic, more real — it didn’t just belong to the child with the neatest handwriting and everyone had created something unique rather than just paint by numbers learning. In one of the stairwells, the wall had been painted with complete abandon and it was a messy explosion of colour but there was something expressive and utterly joyful about it. The joy of learning was present everywhere you looked. Founder of Reimaginaire, trainer and coach with Tuff Leadership Training, host of Leadermorphosis podcast.